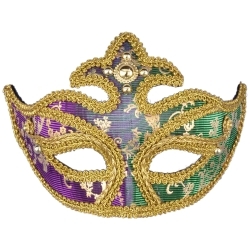 The color changing Mardi Gras half mask is sure to grab the attention of those around you while attending Mardi Gras or a Mardi Gras themed party. The special weave of the material causes it to change from green to purple and back depending on the angle that you are looking at the mask from. The color changing Mardi Gras half mask is made of clear rigid plastic covered in special color changing fabric.